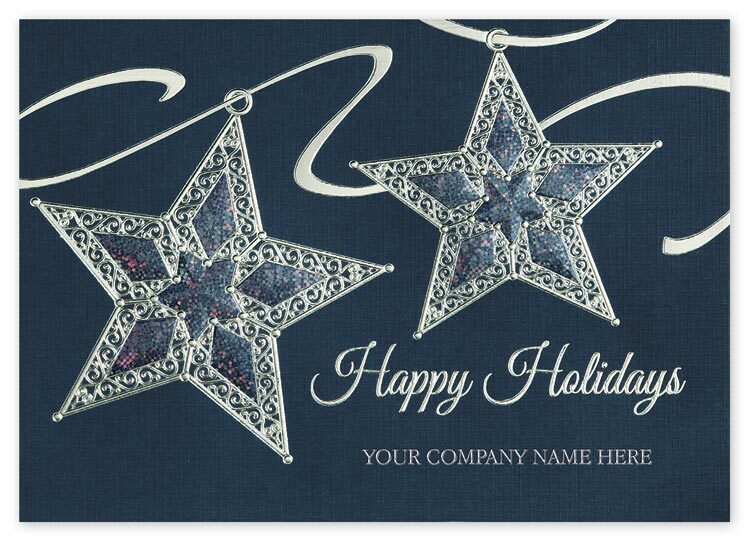 A charming and eye-catching design makes the Star Shine Card a perfect choice for sending the merriest of wishes.Unique touches include intricately designed star ornaments with prismatic foil, shiny silver ribbon and greeting.Add your company's personalization in shiny silver foil to the 80# midnight blue linen recycled paper with 30% post-consumer recycled fibers. 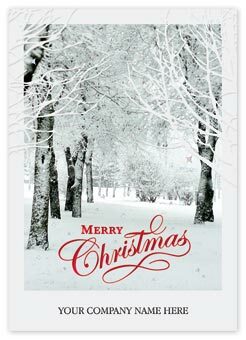 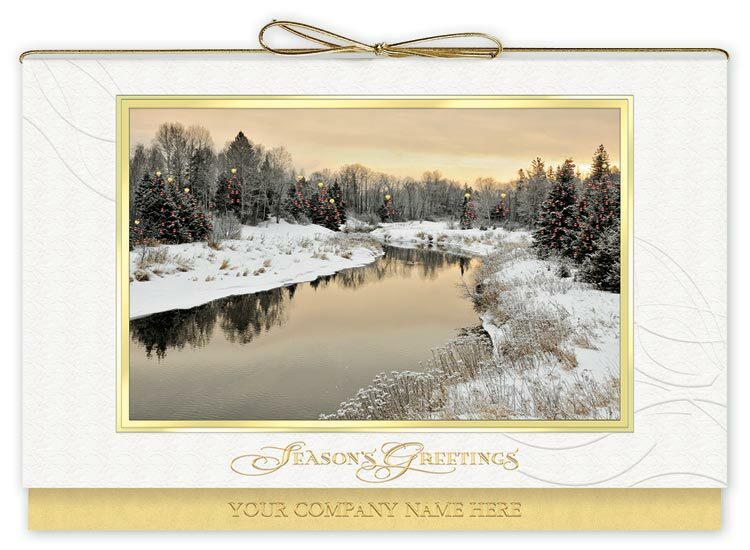 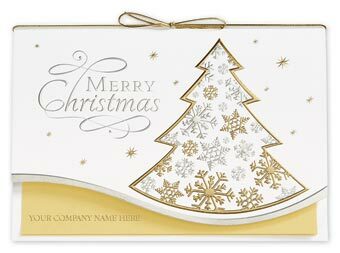 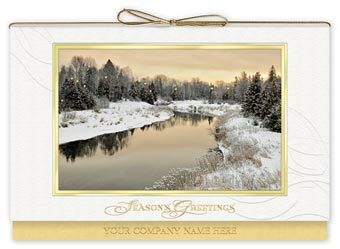 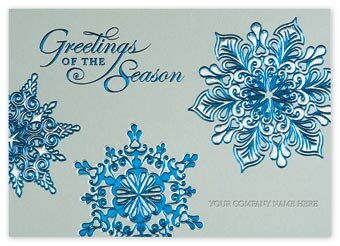 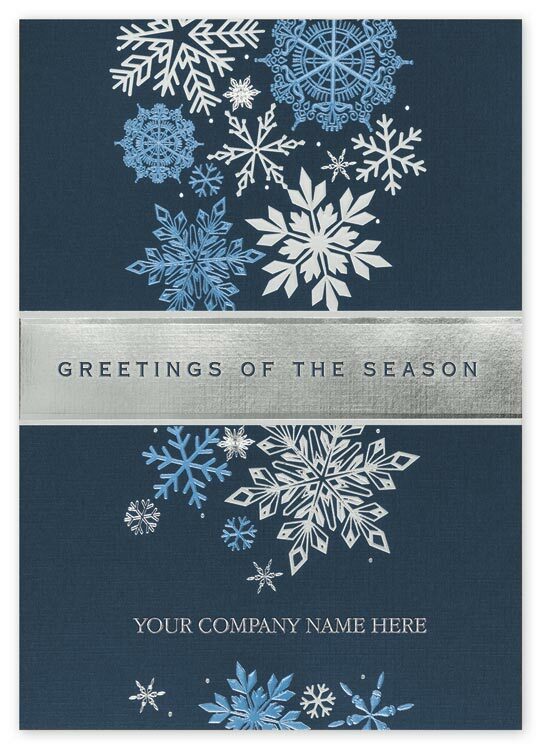 Send greetings that will keep your business top-of-mind with the lovely After the Snowfall Card.Unique touches include prismatic sparkle snowflakes, shiny red greeting, tree branches embossed for texture.Add your company's personalization in black foil to the high-quality 80# white paper stock. 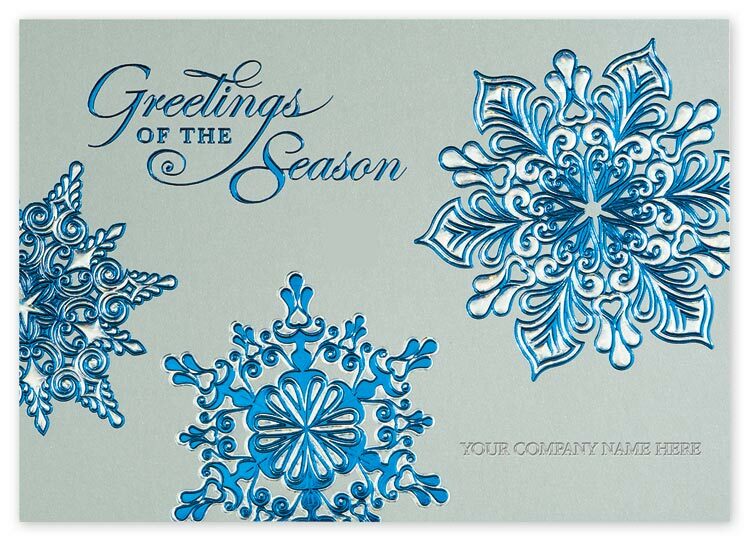 A charming and eye-catching design makes the Silver Blue Card a perfect choice for sending the merriest of wishes.Unique touches include shiny turquoise foil, silver prismatic foil and turquoise greeting.Add your company's personalization in silver foil to the high-quality metallic brushed-silver paper stock. 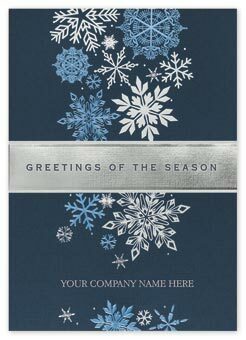 Impress your clients with the classically modern Fall of Flakes Card.Unique touches include silver, light blue, white snowflakes; greeting is cut from foil to have the midnight blue paper show through.Add your company's personalization in silver foil to the 80# midnight blue linen recycled paper stock with 30% post-consumer recycled fibers. 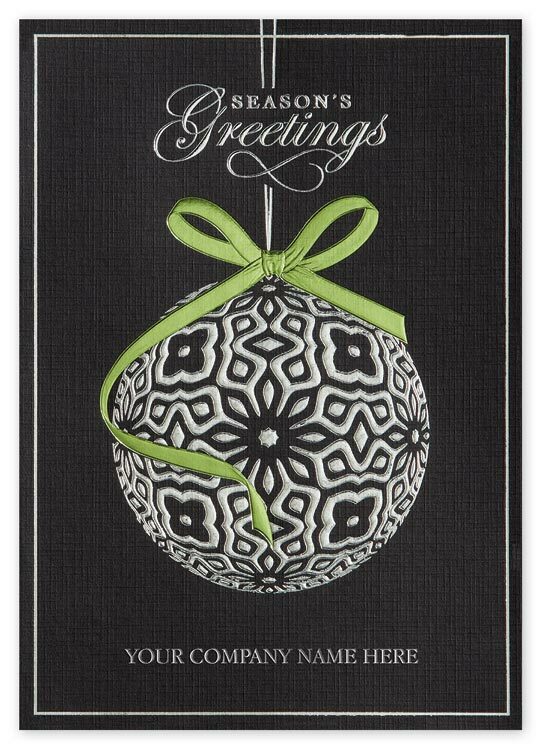 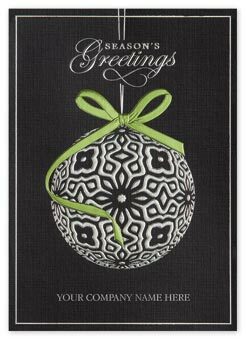 Beautifully designed, the Crystal Ball Card delivers high-quality greetings from your company with a personalized message.Unique touches include silver textured foil in ornament design, shiny green foil ribbon, shiny silver and embossed greeting.Add your company's personalization in silver foil to the 80# black linen recycled paper stock with 30% post-consumer recycled fibers. 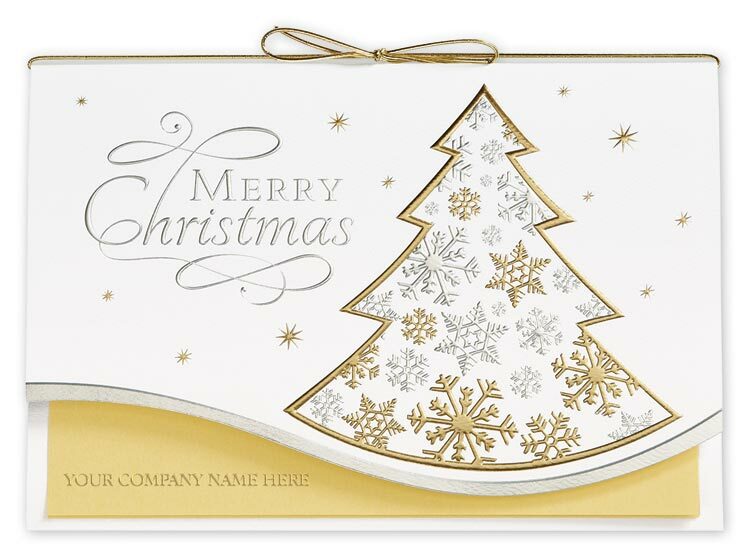 Pretty and festive, the On Golden Flakes Card is a fresh way to delight every client on your mailing list with a personalized message.Unique touches include silver and gold embossed foil design, silver embossed matte foil greeting and a die-cut edge.Cover printed on 80# felt white recycled paper stock; 30% post-consumer recycled fibers. 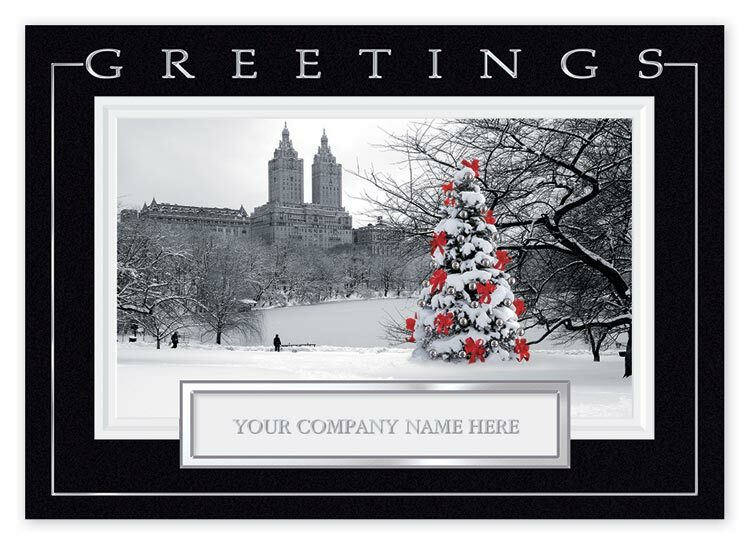 Beautifully designed with red highlights, the Central Park Joy Card delivers high-quality greetings from your company with a personalized message.Unique touches include shiny silver foil greeting, a die-cut window border and an embossed white frame.Add your company's personalization to the high-quality white paper stock. 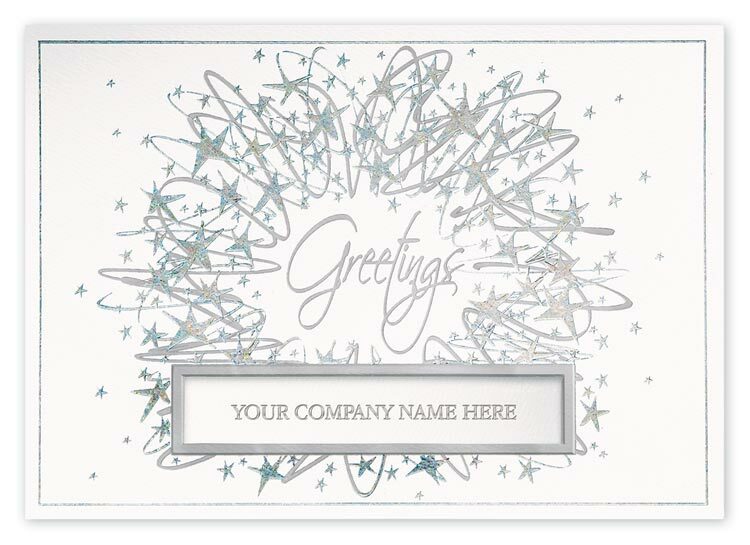 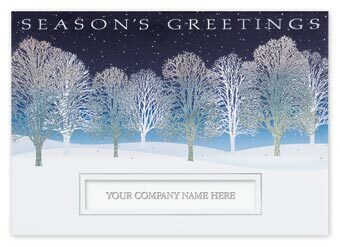 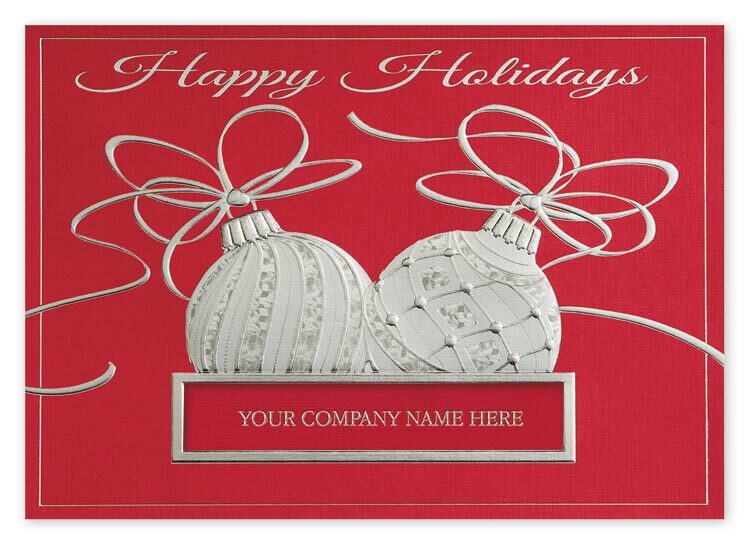 Send greetings that will keep your business top-of-mind with the lovely Silver Grove Card with a personalized message.Unique touches include matte silver foil greeting and die-cut window border, silver prism foil snowflakes.Add your company's personalization to the high-quality white paper stock. 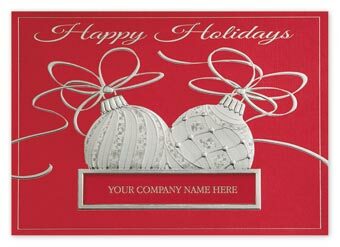 Pretty and festive, the Ornaments of Silver Card is a fresh way to delight every client on your mailing list.Unique touches include ornaments are detailed with matte and shiny textured foil, shiny silver greeting and die-cut window border.Add your company's personalization to the 80# red linen recycled paper stock with 30% post-consumer recycled fibers. 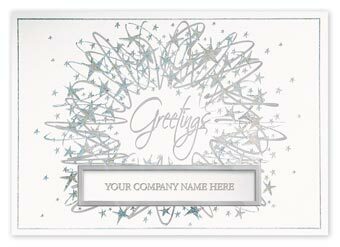 Showcase your company name through a die-cut window and send greetings that will keep your business top-of-mind with the lovely Crystal Vision Card.Unique touches include silver and prismatic wreath, greeting and a die-cut window border.Add your company's personalization to the 80# felt white recycled paper stock with 30% post-consumer recycled fibers. 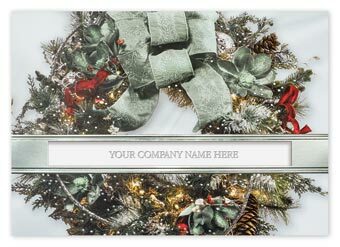 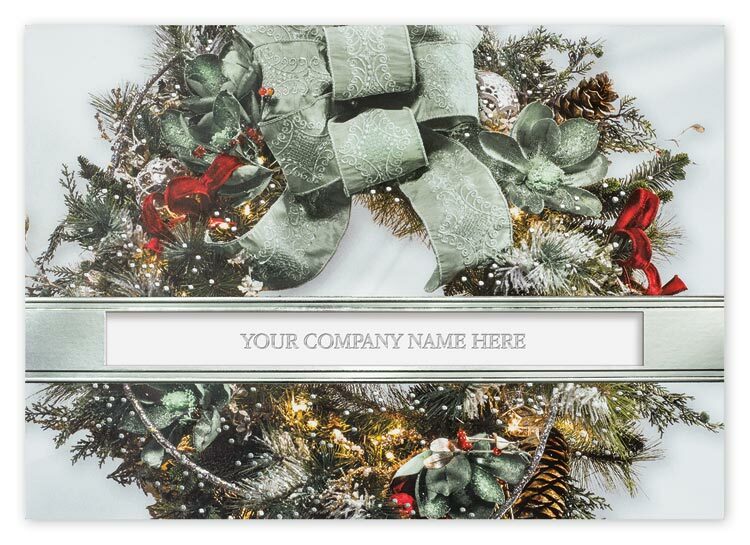 Pretty and festive, the Dusted in Wonder Card is a fresh way to delight every client on your mailing list and showcase your company name through a die-cut window.Unique touches include photographic wreath with silver frame around die-cut window.Add your company's personalization to the high-quality white paper stock. 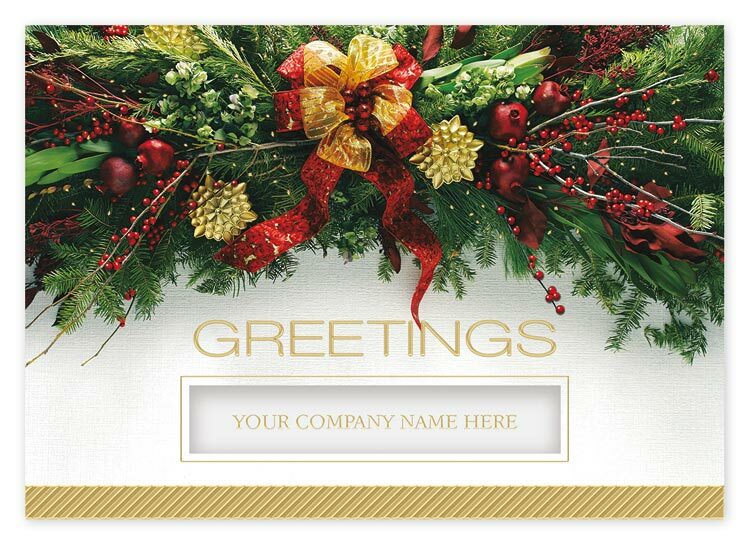 Showcase your company name through an elegant die-cut window and send greetings that will keep your business top-of-mind with the lovely Ring of Gold Card.Unique touches include photographic image accented with gold foil accents, gold embossed foil greeting and die-cut window border.Add your company's personalization to the high-quality white paper stock. 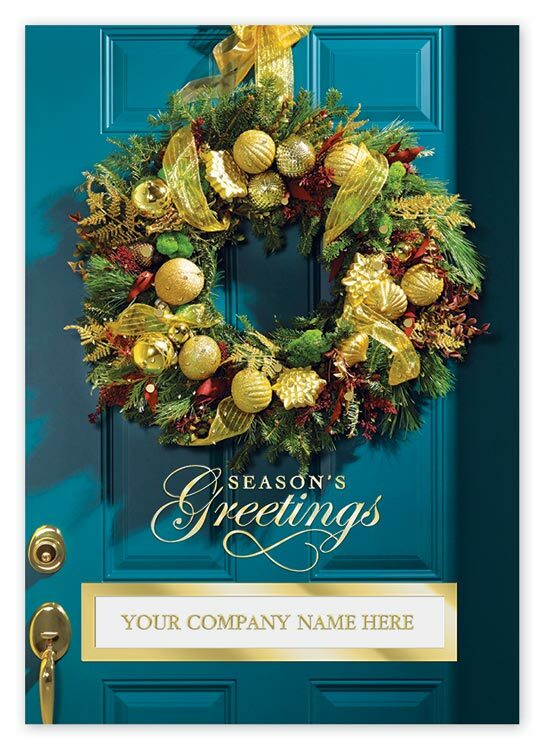 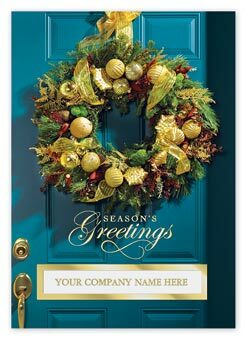 Pretty and festive, the Grand Greetings Card is a fresh way to delight every client on your mailing list and showcase your company name through an elegant die-cut window.Unique touches include embossed red foil berries, shiny gold embossed foil greeting and band.Add your company's personalization to the high-quality white paper stock.